We’re already offering some bundles for our products (with up to 35% discount in case of the Big Bundle). Today, we’ve launched our new Duplicate Bundle. It contains our solutions to remove duplicate files and duplicates in Outlook. By purchasing both programs in a bundle, you’ll get a 25% discount over the normal price. Please find the bundle here. 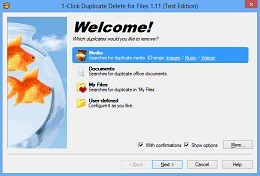 We’ve just published version 1.01 of our duplicate-file-detection software. The new version improves Vista compatibility and fixes a problem with choosing the foldes on some systems. For more information and download links, please visit the product’s homepage. I hope you had a great New Year’s Party and a good start into 2009. The new product allows you to quickly search the harddisk (or certain folders) for duplicate files. Just like our 1-Click Duplicate Delete for Outlook it’s optimized for speed and intelligent suggestions for your search criteria. Furthermore you can limit your search to file types like images, music or video. So, if you’d like to find out how much space you could save on your harddisk, download the Demo Version.